Product #6096 | SKU 3309H00210 | 0.0 (no ratings yet) Thanks for your rating! The AKG WMS 470 Presenter Set Wireless Microphone System delivers quality, reliable wireless transmission, flexible features and intuitive control for speech, presentations, sermons, instruction and more. 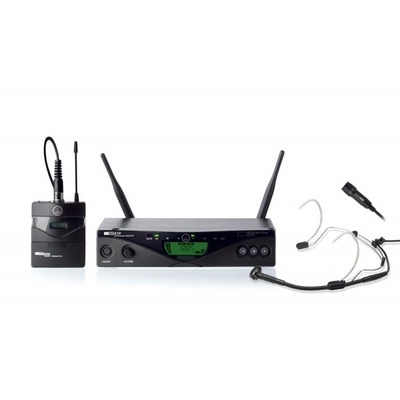 The WMS 470 Presenter Set consists of the SR470 diversity receiver, PT470 bodypack transmitter, CK 99 L lavalier microphone and C 555 L headworn microphone. Automatic setup allows for quick and easy configuration to those who are less familiar with operating wireless microphone systems. Infrared sync between the transmitter and receiver allows for remote channel syncing. The transmitter omits 50mW of output power, is lightweight and operates for up to 14 hours on a single AA (lithium) battery. Additional features include all-metal receiver construction, balanced and unbalanced audio outputs and up to 16 pre-programmed frequencies per group over the 30.5 MHz tuning range.